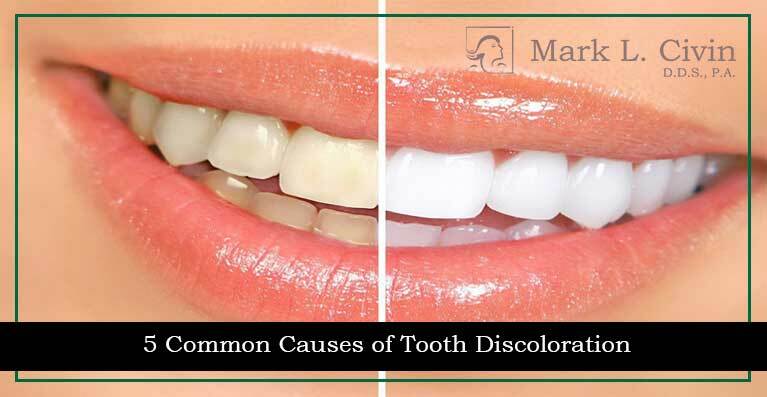 5 Common Causes of Tooth Discoloration - Mark L. Civin D.D.S. Picture this: it’s Friday night and you’re preparing for a date. As you’re examining yourself in the mirror right before you leave for the date, you flash a smile to complete the whole ensemble. Unfortunately, you see a faded and discolored smile staring right back at you. Unfortunately, tooth discoloration is easy to obtain, but luckily, it’s easy to avoid as well. Check out these 5 common causes of tooth discoloration, so you can be aware of what could possibly be causing your pearly whites to fade. A huge problem is not looking after your teeth. The way teeth yellowing forms is from plaque and stain-creating substances touching your teeth and then remaining there. The more routine brushing and flossing you do, the more unwanted substances you can remove from your teeth. It’s an unfortunate but obvious truth that coffee is anything but kind to your teeth when it comes to de-whitening them. Darker foods and drinks, like coffee, red wine, or dark sodas, are highly likely to stain your teeth and prevent them from becoming whiter. There are a few ways to keep stained teeth from forming, such as substituting coffee with light colored tea, or rinsing your mouth out with water right after you’ve finished indulging in these addicting food and beverages. Your enamel is a very important part of your teeth, as it’s the hard substance outside of your teeth protecting them from unwanted germs and bacteria. Underneath this enamel is the Dentin, which also fights to protect your teeth. Sometimes, when a disease or infection strikes, your enamel can be attacked. This prevents enamel from protecting your teeth and keeping them looking white. Sometimes, a disease can be formed as a baby and can stop your enamel from fully forming, resulting in a more difficult attempt at keeping your teeth clean and white. Be sure to be aware of what types of medication you are giving to your children as some may be more harmful to your child’s teeth than you realize. Kids under the age of 8 are more prone to the yellowing of teeth when they take antibiotics like tetracycline and doxycycline since their teeth are still forming and growing. Because of this, there’s a slight chance their teeth can appear yellow while they’re growing in. Even though you’re an adult, you’re still not off the hook when it comes to teeth yellowing from medication. You could fall victim to this if you take different antihistamines such as high blood pressure medications or even Benadryl. Another thing causing your teeth to yellow is the regular use of tobacco products, including chewing and smoking. Not only does this make your teeth grow yellow over time, it can also even cause them to fade into a faint shade of brown if not properly cared for. Nobody likes to experience or look at yellow teeth. But with proper care of your teeth, and being aware of what’s damaging to your teeth, you can prevent that unattractive yellow shade from forming.